Stationary Tilt Tables from BHS are a core component of industrial material handling systems. 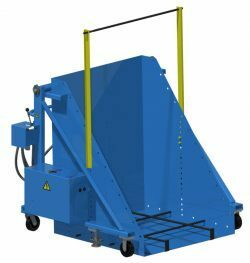 The product line includes ergonomic work positioners and dumping equipment designed specifically for common industry containers and components. Every Tilt Table from BHS features powerful, in-frame hydraulics, full steel construction, and a durable powder coating. These Tilt Tables are built to last for generations in manufacturing, warehousing, and general material handling applications, especially those that involve heavy loads or harsh chemicals. If the products below don’t quite meet a particular material-handling or work-positioning challenge, contact BHS at 1.800.BHS.9500 to learn more about custom equipment manufactured to order. Ergonomic material positioning for industrial settings. Position and dump Gaylords and other bulk material boxes. Tilt bulk containers or flip heavy components including dies, coils, and molds. What type of materials do you typically work with? If you ship or receive small, loose materials as a regular part of your business, for instance, odds are you deal with Gaylord boxes frequently. In that case, the Gaylord Tipper would provide the greatest benefits. Do you need to empty containers or simply position them for more ergonomic manual handling of contents? Standard Tilt Tables help to prevent injuries associated with awkward bending and lifting associated with reaching repeatedly into bulk boxes, but the platform only tilts 45 degrees. Gaylord Tippers and Upenders are better choices in applications that dump bins and boxes. How portable do you need tilting or dumping equipment to be? Stationary Tilt Tables are not, in fact, entirely stationary. Gaylord Tippers can be fitted with heavy-duty casters for simple positioning throughout a facility. Tilt Tables and Upenders can be equipped with fork pockets or mounted onto pallets to improve mobility. However, if you require even more portable work positioning — or if forklifts aren’t allowed into the workspace, as in certain food production operations — consider the BHS line of Mobile Tilt Tables. 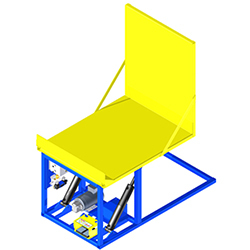 As a designer and manufacturer of original equipment, BHS also offers custom-built Tilt Tables for unique applications. Design engineers and the manufacturing team at BHS can modify any of the above models to meet custom specifications, or even create new equipment from scratch. Stationary Tilt Tables from BHS position work to improve ergonomics, leading to fewer injuries and a happier, more productive workforce. When used to empty boxes, they remove the hazards associated with heavy lifting, falling materials, and splashback. In any application, Tilt Tables create a safer, more efficient operation. Contact the BHS sales team at 1.800.BHS.9500 to learn more about Stationary Tilt Tables or to find a dealer near you.